Is Romney's effective tax rate lower than yours? Presidential hopeful Mitt Romney likely pays a low effective tax rate because much of his income comes from tax-advantaged investments. But it's not necessarily lower than most people's. 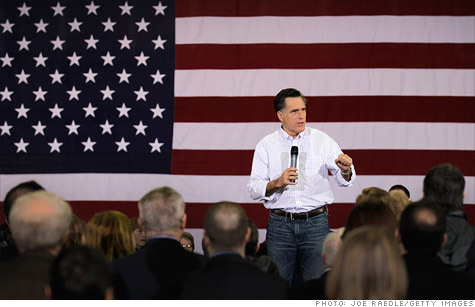 NEW YORK (CNNMoney) -- So Mitt Romney thinks his effective tax rate is about 15%. That prompts many people to express disbelief: "What?! Most people pay a higher rate than that, don't they?" In fact, depending on how it's measured, Romney's effective tax rate is likely higher than what many, if not most, Americans pay. Keep in mind, an effective tax rate is not the top income tax rate you pay. Those rates can run anywhere from 10% to 35%, depending on how high your income is. By contrast, the effective rate generally is a measure of how much you pay in taxes as a percentage of your income. But the rate can be calculated in different ways since there are a lot of ways to define taxes. Do you just look at federal income taxes paid, or at all federal taxes? Likewise, there's more than one way to measure income. Gross? Adjusted gross? Taxable? It's not yet possible to verify whether Romney's effective rate is actually 15%. That may only happen if and when he releases his tax returns, which will have more detail about his income and deductions. But assuming he's correct, here's why his effective rate is probably higher than most people's: The effective tax rate is always going to be lower than one's top income tax rate. And the top rate for roughly four-fifths of Americans is 15% or less, said Roberton Williams, a senior fellow at the Tax Policy Center. In other words, 80% of Americans have an effective rate below 15%. The lowest income families actually have negative average effective tax rates when income tax liability alone is measured. For families making $50,000 to $75,000, the effective tax rate is 5.7%. From $75,000 to $100,000, it's 7.2%. And if you make $200,000, it goes up to 9.9%. Why are effective rates so low for most Americans, especially compared to their statutory income tax rates? The same reason why nearly half of all U.S. households end up having no federal income tax liability, and many more end up with low tax bills: A bevy of credits, deductions and exemptions that cancel out all or much of the income tax they would otherwise owe. On the highest end of the income scale, the average effective tax rate is much higher -- 18.9% for households making more than $1 million. But that's still far below the 35% top tax rate much of their ordinary income would be subject to. Why? Because a lot of households at that level -- like Romney's -- make a lot of their money from tax-advantaged investments, such as capital gains and tax-free bonds. And they tend to have a lot of itemized deductions, which can greatly reduce how much they owe the tax man. How rich are the candidates? GOP tax plans: What would Buffett pay?